Also known as Chlorastrolite, is a green or bluish green stone. 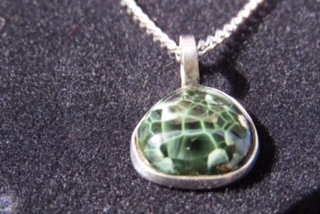 Greenstone has finely radiated or stellate masses that have a "turtleback" pattern. The stellate masses tend to be Chatoyant, meaning they have a changeable luster as the stone is moved or viewed from different angles. This chatoyancy can be subtranslucent to opaque. 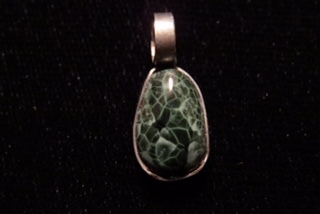 Greenstone is the Michigan state gemstone and is found in the Keweenaw Peninsula of upper Michigan and Isle Royale. Isle Royale is a National Park, and so it is illegal to collect gemstones there. 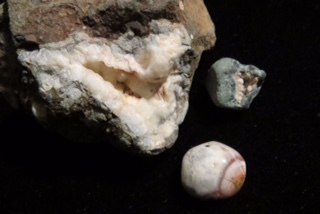 Its quite difficult to identify unpolished greenstone, and stones larger that a half inch are rarely found. The Smithsonian Museum is home to the largest gemstone quality greenstone that measures 1.5 inches by 3 inches.